Did your WordPress website run into the PHP Fatal error ‘Allowed memory size of 134217728 bytes exhausted’? Did you get loading errors 500 from time to time without any noticeable reasons? This can happen if there is not enough memory assigned to the PHP Hypertext Preprocessor or if the memory consumption of your WordPress Installation is limited. How to fix the Memory Exhausted Error? This should be at least 128M or better 256M or higher. Save the file as info.php and upload it to the root of your website via FTP or a file manager plugin. This line tells you the exact amount of memory in megabytes your site uses. For WordPress, this memory limit should be at least 128M or better 256M. Please ask your hosting provider where you can find the PHP.ini. Now, open the file info.php or the system info log again and check out if the memory limit has been increased. If you were successful and phpinfo() shows the correct memory_limit you can use again WP Staging and the ‘Allowed memory size exhausted’ error should be solved and gone. 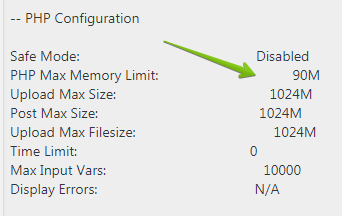 If you still get the error you can also try to increase the WordPress Memory Limit. Now, try again if WP Staging works as intended. If you are still not able to increase the memory limit please ask your hosting provider if they can do it for you.